Wide Asleep in America: In Fraud, We Trust? Douter de tout ou tout croire, ce sont deux solutions également commodes, qui l'une et l'autre nous dispensent de réfléchir. Still high from Barack Obama's Cairo speech and Lebanon's recent elections that saw the pro-Western March 14 faction barely maintain its majority in the Chamber of Deputies, the mainstream media fully expected a clean sweep for "reformist" candidate Mir Hossein Mousavi in Iran's June 12th presidential election. They reported surging poll numbers, an ever-growing Green Wave of support for the challenger, while taking every opportunity to get in their tired and juvenile epithets, their final chance to demonize and defame the incumbent Dr. Mahmoud Ahmadinejad, whom they were convinced had absolutely no chance of winning reelection. Before the polls even closed, Mousavi had already claimed victory. "In line with the information we have received, I am the winner of this election by a substantial margin," he said. "We expect to celebrate with people soon." However, according to the chairman of the Interior Ministry's Electoral Commission, Kamran Daneshjoo, with the majority of votes counted, the incumbent president had taken a seemingly unassailable lead. It didn't take long before accusations started flying, knee-jerk reactions were reported as expert analysis, and rumor became fact. As Supreme Leader Ali Khamenei congratulated Ahmadinejad on his landslide victory, calling it a "divine assessment," the opposition candidates all cried foul. Mousavi called the results "treason to the votes of the people" and the election a "dangerous charade." Karroubi described Ahmadinejad's reelection as "illegitimate and unacceptable." The Western media immediately jumped on board, calling the election a "fraud," "theft," and "a crime scene" in both news reports and editorial commentary. Even so-called progressive analysts, from Juan Cole to Stephen Zunes to Dave Zirin to Amy Goodman to Trita Parsi to the New Yorker's Laura Secor, opined on the illegitimacy of the results. They cited purported violations, dissident testimony from inside sources, leaked "real" results, and seeming inconsistencies, incongruities, and irregularities with Iran's electoral history all with the intention of proving that the election was clumsily stolen from Mousavi by Ahmadinejad. These commentators all call the continuing groundswell of protest to the poll results an "unprecedented" show of courage, resistance, and people power, not seen in Iran since the 1979 revolution. To me, the only thing unprecedented about what we're seeing in Iran seems to be the constant media hysteria, righteous indignation, and hypocritical pseudo-solidarity of the West; a bogus, biased, and altogether presumptuous and uncritical reaction to hearsay and conjecture, almost totally decontextualized in order to promote sensational headlines and build international consensus for foreign intervention in Iran. The foregone (and totally unsubstantiated) conclusions drawn by a rabid, clucking media have led to an ever-growing outrage over the elections results. Weak theories are tossed around like beads on Bourbon Street and assumed to be "expert analysis" and beyond reproach. By now, the accusations are well-known. However, with a little perspective and rational thought, the "evidence" that purportedly demonstrates proof of a fixed election winds up sounding pretty forced. With closer inspection and added context, the arguments crumble and are revealed not to be very compelling, let alone convincing. "What is astonishing about the West’s universal condemnation of the electoral outcome as fraudulent is that not a single shred of evidence in either written or observational form has been presented either before or a week after the vote count. During the entire electoral campaign, no credible (or even dubious) charge of voter tampering was raised. As long as the Western media believed their own propaganda of an imminent victory for their candidate, the electoral process was described as highly competitive, with heated public debates and unprecedented levels of public activity and unhindered by public proselytizing. The belief in a free and open election was so strong that the Western leaders and mass media believed that their favored candidate would win." Most of these claims rest on the brash and offensive assumption that these "experts" know how Iranians would vote better than Iranians do. Clearly, they argue, Mousavi would win his hometown of Tabriz in the heart of East Azerbaijan, since he's an ethnic Azeri with an "Azeri accent" and Iranians always vote along geographical and ethnic lines. And yet, Ahmadinejad won that province by almost 300,000 votes. Curious, no? Furthermore, in a pre-election poll Azeris favored Ahmadinejad by 2 to 1 over Mousavi. Furthermore, Petras notes, "The simplistic assumption [of the Western media] is that ethnic identity or belonging to a linguistic group is the only possible explanation of voting behavior rather than other social or class interests. A closer look at the voting pattern in the East-Azerbaijan region of Iran reveals that Mousavi won only in the city of Shabestar among the upper and the middle classes (and only by a small margin), whereas he was soundly defeated in the larger rural areas, where the re-distributive policies of the Ahmadinejad government had helped the ethnic Azeris write off debt, obtain cheap credits and easy loans for the farmers. Mousavi did win in the West-Azerbaijan region, using his ethnic ties to win over the urban voters." Additionally, it should be noted that, although there is a wide diversity of ethnic groups within Iranian society, most of them share a common history and Iranian identity. This is certainly the case within the Azeri community of Northwest Iran. We have been told for quite some time now that "public opinion polls suggest that foreign pressure to discontinue Iran's nuclear program has contributed to a rise in patriotism because public support for the Iran's nuclear program has been strong. Support for the program transcends political factions and ethnic groups." Considering that Ahmadinejad's four years of standing strong in the face of such aggressive and threatening foreign pressure has played well with the public, as opposed to Mousavi's more conciliatory tone with regards to bettering relations with Western powers, it is hardly a stretch or a surprise that Ahmadinejad would be supported by such large swaths of the population across all demographics. The voting habits of ethnic Lur voters in reformist candidate Mehdi Karroubi's home province are also assumed to be known by Western analysts. If he won five million votes in 2005, why did he only clear about 300,000 this time around? How could Ahmadinejad win in Tehran, when Mousavi's base of upper and middle class cosmopolitan youths, university students, and wealthy business-owners reside there? Plus, Mousavi is said to have been popular in urban areas, where Ahmadinejad was seen as holding less sway. So how could Mousavi possibly lose? These questions are valid, for sure, but they have equally rational answers. Karroubi wasn't a contender in this race like he was four years ago. There was no incumbent president at that time (President Khatami had just completed his second term) and the candidate field was wide open. Karroubi had a pro-reform and pro-populist message that appealed to many unsure of whom to vote for. He did well in his hometown. But 2009 is not 2005. After four years of Ahmadinejad's presidency, the rural Iranian voting bloc strongly supports his economic, domestic, and foreign policies. It is irresponsible to assume that Karroubi's "reformist" support would turn heavily to Mousavi since Karroubi had no chance of winning this year. He has long been a staunch opponent of Iranian political stalwart and former president Akbar Hashemi Rafsanjani, who is closely aligned with Mousavi. Karroubi's populist approach to the economy is more like Ahmadinejad's than Mousavi's. The fact that minor candidates such as Karroubi would garner fewer votes than expected, even in their home regions as critics charge, is not out of the ordinary. Many voters reach the conclusion that they do not want to waste their votes when the contest is perceived to be between two major candidates. Karroubi indeed received far fewer votes this time around than he did in 2005, including in his hometown. Likewise, Ross Perot lost his home state of Texas to Bob Dole of Kansas in 1996, while in 2004, Ralph Nader received one eighth of the votes he had four years earlier. More than thirty pre-election polls were conducted in Iran since President Mahmoud Ahmadinejad and his main opponent, former Prime Minister Mir Hossein Mousavi, announced their candidacies in early March 2009. The polls varied widely between the two opponents, but if one were to average their results, Ahmadinejad would still come out on top. However, some of the organizations sponsoring these polls, such as Iranian Labor News Agency and Tabnak, admit openly that they have been allies of Mousavi, the opposition, or the so-called reform movement. Their numbers were clearly tilted towards Mousavi and gave him an unrealistic advantage of over 30 per cent in some polls. If such biased polls were excluded, Ahmadinejad’s average over Mousavi would widen to about 21 points. One poll conducted before the election by two US-based non-profit organizations forecast Ahmadinejad's reelection with surprising prescience. The survey was jointly commissioned by the BBC and ABC News, funded by the Rockefeller Brothers Fund, and conducted by the New America Foundation's nonprofit Center for Public Opinion, which, "has a reputation of conducting accurate opinion polls, not only in Iran, but across the Muslim world since 2005." The poll predicted an election day turnout of 89%, only slightly higher than the actual 85% who voted (that's a difference of fewer than 2 million ballots). According to pollsters Ken Ballen and Patrick Doherty, the "nationwide public opinion survey of Iranians three weeks before the vote showed Ahmadinejad leading by a more than 2 to 1 margin - greater than his actual apparent margin of victory in Friday's election." "Much commentary has portrayed Iranian youth and the Internet as harbingers of change in this election. But our poll found that only a third of Iranians even have access to the Internet, while 18-to-24-year-olds comprised the strongest voting bloc for Ahmadinejad of all age groups. The only demographic groups in which our survey found Mousavi leading or competitive with Ahmadinejad were university students and graduates, and the highest-income Iranians. When our poll was taken, almost a third of Iranians were also still undecided. Yet the baseline distributions we found then mirror the results reported by the Iranian authorities, indicating the possibility that the vote is not the product of widespread fraud." American “Iran experts” missed how Ahmadinejad was perceived by most Iranians as having won the nationally televised debates with his three opponents – especially his debate with Mousavi. Before the debates, both Mousavi and Ahmadinejad campaign aides indicated privately that they perceived a surge of support for Mousavi; after the debates, the same aides concluded that Ahmadinejad’s provocatively impressive performance and Mousavi’s desultory one had boosted the incumbent’s standing. Ahmadinejad’s charge that Mousavi was supported by Rafsanjani’s sons – widely perceived in Iranian society as corrupt figures – seemed to play well with voters. Similarly, Ahmadinejad’s criticism that Mousavi’s reformist supporters, including former President Khatami, had been willing to suspend Iran’s uranium enrichment program and had won nothing from the West for doing so tapped into popular support for the program – and had the added advantage of being true. Conversely, Ahmadinejad - as both his supporters and detractors would readily admit - is nothing if not an engaging, animated, and impassioned speaker. His outspoken nature and refusal to be bullied by opponents is apparent to anyone who has ever heard or seen him speak, whether they agree with what he says or not. Anyone who believes Mousavi won these debates either didn't actually watch them and/or decided to uncritically believe talking points distributed by the Mousavi campaign about their candidate's inspired performance. Opponents of Ahmadinejad in the Western press - or, more accurately, everyone in the Western press - consistently refer to Ahmadinejad as an entrenched, establishment politician who has the unconditional backing of Iran's powerful theocratic hierarchy. As such, the current unrest in the nation's capital has been described as a grassroots, largely secular movement aimed at upsetting the religious orthodoxy of the government - embodied in such reports by Ahmadinejad himself - in an effort to fight for more personal freedoms and human rights in defiance of the country's revolutionary ideals. These reports betray the journalists' obvious misunderstanding of Iranian politics in general, and certainly of President Ahmadinejad's personal politics in particular. In fact, Newsweek reported that, on Wednesday morning of last week, Mousavi's wife, Zahra Rahnavard, who was with her husband throughout the presidential campaign, felt the need to remind a group of students that she and her husband still believe in the ideals of the revolution and don't regard anti-Islamic Revolution elements as their allies. Furthermore, even though here in the US, he is variably referred to as "hardline" and a religious conservative, Ahmadinejad is far more of a populist politician, consistently favoring nationalization, the redistribution of Iran's oil wealth, controlled prices of basic consumer goods, increased government subsidies, salaries, benefits, and insurance and continued opposition to foreign investment over his opponents' calls for more free-market privatization of education and agriculture, as well as the promotion of neoliberal strategies. Leading up to the election, Mousavi condemned what he called Ahmadinejad's "charity-based economic policy." I wonder how that attack played with the middle, lower, and impoverished classes of Iran's voting public. Oh right, Ahmadinejad got 63% of the vote, even if Juan Cole didn't want him to. Ahmadinejad has often drawn the ire of both Iranian clerics and legislators alike for his outspoken views. In March 2008, The Economist noted that influential conservative clerics are said to be irritated by his "folksy and superstitious brand of ostentatious piety and his favouritism to men of military rather than clerical backgrounds." The conservative Rand Corporation even reminds us, "He is not a mullah; public frustration with rule by mullahs made this a very positive characteristic. He comes from a working-class background, which appealed to lower-income Iranians, the bulk of the electorate, yet he has a doctorate in engineering." In the 2005 presidential election, Ahmadinejad emerged as a dark horse to challenge front-runner and assumed shoe-in, former president Ali Akbar Hashemi Rafsanjani. As the son of a blacksmith, "Ahmadinejad benefited from the contrast between his modest lifestyle and Rafsanjani’s obvious wealth, commonly known to stem from corruption." The Rand report reiterates that "Rafsanjani is extraordinarily corrupt." He suggested that some leaders had indulged in an inappropriately lavish lifestyle, naming, among others, a former speaker of Parliament, Ali Akbar Nateq Nouri, who has opposed some of Mr. Ahmadinejad’s policies. Mr. Nouri, a conservative, ran unsuccessfully for president in 1997. Mr. Ahmadinejad’s remarks seemed to suggest a deepening divide between the president and a number of influential leaders, including some conservatives who belong to a faction that has supported Mr. Ahmadinejad. Whereas these remarks may have struck a chord with the Iranian public, they provoked a stern rebuke from Supreme Guide Khamenei at last Friday's post-election prayer service. Khamenei, breaking a long-standing tradition of not mentioning specific people during his address, defended Rafsanjani's reputation by describing him as "one of the most significant and principal people of the movement in the pre-revolution era...[who] went to the verges of martyrdom several times after the revolution," also pointing out his bona fides as "a companion of Imam Khomeini, and after the demise of Imam Khomeini was perpetually a comrade of the leader." Rafsanjani is currently the speaker of the Assembly of Experts, an 86 member elected council of clerics responsible for appointing and, if need be, dismissing and replacing the Supreme Guide of the Islamic Republic. In September 2007, Rafsanjani was elected speaker after decisively defeating a candidate supported by Ahmadinejad. He is also currently the leader of the Expediency Council which is "responsible for breaking stalemates between the Majlis and the Guardian Council, advising the Supreme Leader, and proposing policy guidelines for the Islamic Republic." As such, the Expediency Council limits the power wielded by the conservative Guardian Council, a body consisting of twelve jurists who evaluate the compatibility of the Majlis [Parliament]'s legislative decisions with Islamic law and the Iranian constitution. Moreover, in 2005, Khamenei strengthened the role of the Expediency Council by granting it supervisory powers over all branches of government, effectively affording the Expediency Council and its leader, Rafsanjani, oversight over the presidency. As a result, Rafsanjani retains a tremendous amount of power within Iranian politics. His strong support, both outspoken and financial, for Mousavi should show clearly that Mousavi - who was the Iranian Prime Minister during the Iran-Iraq War - is not some scrappy reformist challenger to the upper tiers of the Islamic Republic. He is as establishment as anyone else, if not more so. For those who do not know Iran better, suffice to say that the Rafsanjani family clan owns vast financial empires in Iran, including foreign trade, vast landholdings and the largest network of private universities in Iran. Known as Azad there are 300 branches spread over the country, they are not only money-spinners but could also press into Mousavi's election campaign an active cadre of student activists numbering some 3 million. The Azad campuses and auditoria provided the rallying point for Mousavi's campaign in the provinces. The attempt was to see that the campaign reached the rural poor in their multitudes who formed the bulk of voters and constituted Ahmadinejad's political base. Rafsanjani's political style is to build up extensive networking in virtually all the top echelons of the power structure, especially bodies such as the Guardian Council, Expediency Council, the Qom clergy, Majlis, judiciary, bureaucracy, Tehran bazaar and even elements within the circles close to Khamenei. He called into play these pockets of influence. The Grand Ayatollah Hossein Ali Montazeri has already come out against the election results, once again showing that the dynamic of the Iranian government is not that of a monolithic dictatorship, but a complex network of power plays. Basically, what we're seeing is all politics, and not a revolutionary uprising. As allegations of fraud spread, Mousavi supporters in the United States seemed not to be able to get their stories straight. In co-ordinated mass emails, sent widely to promote protests across the country (and with all the "grassroots" pizzazz of those corporate-sponsored Republican Teabagging Parties in April), a number of unsubstantiated claims are noted as "Basic Statistics." 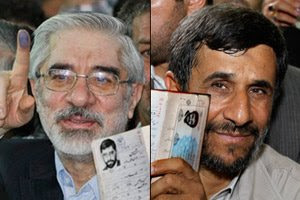 Some claim that there were not enough ballots available to the voting public, while others suggest that there were too many ballots in an attempt to stuff ballot boxes with pro-Ahmadinejad votes. It is claimed that "Voting irregularities occurred throughout Iran and abroad. Polls closed early, votes were not counted and ballots were confusing." Without providing any evidence of any of these accusations, the message reveals its own inaccuracy by deliberately spreading misinformation. Because turnout on election day was so high in Iran, polls actually remained open for up to four extra hours to allow as many people to cast ballots as possible. If Iranian authorities were prepared for a totalitarian takeover of the country after a faked election, why bother to keep polls open? Also, the ballots weren't confusing. They had no list of names or added legislative initiatives. They had one single, solitary question on them: Who is your pick for president? There is one empty box to note a number corresponding to the candidate of your choice and another box in which you are to write the candidate's name. No hanging chads, no levers to pull, no political parties to consider. Just write the name of the guy you want to win. How is this confusing? The suggestion that the ballots were counted too quickly to reflect a genuine result is in itself bizarre and unfounded. Al-Amin tells us, "There were a total of 45,713 ballot boxes that were set up in cities, towns and villages across Iran. With 39.2 million ballots cast, there were less than 860 ballots per box...Why would it take more than an hour or two to count 860 ballots per poll? After the count, the results were then reported electronically to the Ministry of the Interior in Tehran." "As an employee in City Hall, I was assigned to be a poll worker/watcher at the University of Shiraz on election day and here it was impossible for cheating to have taken place! There were close to 20 observers, from the Guardian Council, the Ministry of the Interior, and more than four-five representatives/observers from each candidate. Everybody was watching every single move, stamp, piece of paper, etc. from the checking of the Shenas-Nameh (personal indentification documentation) to the filling of the ballot boxes, to the counting of each ballot under everyone's eyes, and then registering the results into the computer and sending them to the Interior Ministry...Also, we had extra ballots in Shiraz. It's possible that in some of the smaller villages they ran out of ballots, but the voting hours were extended." The opposition messages state that "The two main state news agencies in Iran declared the winner before polls closed and votes were counted." Actually, as mentioned above, it was Mousavi who declared his own victory several hours before the polls closed. Paul Craig Roberts, who is himself a former US government official, suggests that Mousavi's premature victory declaration is "classic CIA destabilization designed to discredit a contrary outcome. It forces an early declaration of the vote. The longer the time interval between the preemptive declaration of victory and the release of the vote tally, the longer Mousavi has to create the impression that the authorities are using the time to fix the vote. It is amazing that people don't see through this trick." Circulating emails even contain this tidbit: "Two primary opponents of Ahmadinejad reject the notion that he won the election." Talk about proof! Even Mousavi's own official letter of complaint - delivered to the Guardian Council after five days of promoting protests and opposition rallies on the streets of Tehran - is short on substantive allegations and devoid of hard evidence of anything remotely suggestive of voter fraud. The letter, which calls for an annulment of the election results and for a new election to take place, expounds on many non-election related issues, such as the televised debates, the incumbent's access to state-owned transportation on the campaign trail and use of government-controlled media to promote his candidacy. All previous Iranian presidents, including the reformist Mohammad Khatami, who is a main supporter of Mousavi, have used the resources at their disposal for election purposes. Plus, whereas the last point certainly seems unfair, it hardly amounts to fraud. The debates - the first ever held in the history of the Islamic Republic - also served to even up the score for Ahmadinejad's challengers. Mousavi complains that some of his monitors were not accredited by the Interior Ministry and therefore he was unable to independently monitor the elections. However, several thousand monitors representing the various candidates were accredited and that included hundreds of Mousavi's eyes and ears. They should have documented any irregularities that, per the guidelines, should have been appended to his complaint. Nothing is appended to Mousavi's two-page complaint, however. He does allude to some 80 letters that he had previously sent to the Interior Ministry, without either appending those letters or restating their content. Finally, item eight of the complaint cites Ahmadinejad's recourse to the support given by various members of Iran's armed forces, as well as Foreign Minister Manouchehr Mottaki's brief campaigning on Ahmadinejad's behalf. These are legitimate complaints that necessitate serious scrutiny since by law such state individuals are forbidden to take sides. It should be noted that Mousavi can be accused of the same irregularity as his headquarters had a division devoted to the armed forces. Given the thin evidence presented by Mousavi, there can be little chance of an annulment of the result. In response to the accusation of there being more votes in certain areas than registered voters, it must be acknowledged that in Iran, unlike in the United States, eligible voters may vote anywhere they wish - at any polling location in the entire country - and are not limited to their residential districts or precincts as long as their information is registered and valid in the government's database. Families vacationing North to avoid the stifling heat of the South would wind up voting in towns in which they are tourists. Afrasiabi even points out that, whereas "Mousavi complains that in some areas the votes cast were higher than the number of registered voters...he fails to add that some of those areas, such as Yazd, were places where he received more votes that Ahmadinejad." Are these irrefutable examples of an election that was free of all outside interference, irregularities, or potential problems? No, of course not. But there is also no hard proof of a fixed result, let alone massive vote rigging on a scale never before seen in Iran, a country that - unlike the United States - has no history of fraudulent elections. I guess the thousands of people who risk their lives protesting on the streets don't count. Where are the 63% who voted for Ahmadinajed? How come they don't come out and hold peaceful rallies? Writing long essays doesn't make the argument any more sound! Who is saying people on the streets "don't count"? All I am saying is that, if these rallies are about election fraud, then I think the masses may have been duped by the Rafsanjani machine...if, however, this is the beginning of another sort of grassroots movement (though, I have my doubts), one that may change things in Iran for the better, then all the power to the thousands of people in the streets. I feel like "pro-Mousavi" has begun to equal "pro-democracy" in the eyes of many observers and commentators. In my view, this completely misinterprets what we are actually seeing. If Ahmadinejad (whose supporters have actually come in en masse for peaceful victory rallies) won the election fairly - and I personally think there is plenty of evidence to suggest that he did - then what are we seeing in the streets? A disgruntled losing party protesting over an inglorious defeat that they were pretending wasn't inevitable or even foreseeable? I think that the protests have become something else entirely in the past week - something, hopefully, more noble than supporting a pretty uninspiring candidate like Mousavi. I am very upset by the reports of dissent suppression by Iranian authorities - as I have been when the same thing happens here in the United States - but I think that the issues of electoral fraud and the violent and condemnable results of a government trying to put an end to 10 days of protests and unrest in the nation's capital need to be separated and not lumped in as one and the same issue. Imagine what would happen in New York City if hundreds of thousands of people flooded the streets day after day, throwing rocks at police officers, burning motorcycles, busses, and buildings! We'd see martial law within three days, I promise. Note how the media has changed their use of adjectives when describing the situation in Iran...last Saturday everyone wrote about "stolen" elections...now they're merely "contested" and the focus is has completely shifted to issues regarding the government "crackdown." Seems like the press realized the whole "fraud" angle might not pan out for them...now, all of a sudden, after threatening to bomb Iran into oblivion for eight years, Americans are the Iranian peoples' best friends. Seem a bit odd to anyone? I loved the article; like Lord Baltimore's remarks. I also used the analogy of what HAS happened in the USA in past years; we've seen what happens when those of us demonstrated against Vietnam. We saw the shootings at Kent. We witnessed the riots and the deaths during Watts. No government allows any kind of demonstration that doesn't adhere 100% to remaining controlled and peaceful. If anything gets out of hand, the National Guard, police, etc., step and stop it just as it was stopped (or tried to be) in Iran. We don't know the mind-set or purpose of those who chose to demonstrate. We don't know if each were given a small sum of money to promise to demonstrate if Mosavi wasn't elected. We don't know who might be 'pulling the strings', and there's usually either absolutely no reason but anger and emotion that spawns a demonstration, or there's a bigger plan that's funded that also creates an uprising and outburst. Too many stories; too much speculation, and no one writing about it has an inside track on this - to me, this article put it into a logical and sensible summary. People are not very motivated to protest or rally, when they win. This is particularily true when their candidate is the incumbent and the results were not close. The lack of a pro incumbent rally should not be surprising. I don't remember masses of people taking to the streets when Clinton was reelected. Well done! All the Iranian people, the demonstrators, protesters, and their government, all, are only pawns in "our" game. Bob Dylan got it right in Masters of War. Very compelling but this article projects Iranian election system in a better way than that of my home country, India. Surely many electoral malpractices happen in India. But when a candidate doubts his loss, he has always a chance to move the courts of law. Mousavi does not appear to be doing that. is it because of lack of proper judiciary or not, I wonder. Simply, Thank you for speaking facts and truths instead of myths and falsehoods as continually disseminating from the BBC et al who want to manufacture a shallow colour revolution in Iran. The North Tehran syndrome suffers want to impose their corrupt will on an ancient and wise people, whose depth and sageness they thought they could run rough-shod over with Rafsanjani dirty money. Whatever is the will of the Iranian people must be upheld.